Chelsea vs. Tottenham Hotspur : 1 March 2015. On the morning of Sunday 1st. March, I was in no mood for a game of football. And now, a day later, if I am honest I am in no mood to write this match report. This is a “Tale” that I have feared for some time. Its inevitability was certain. It was only a question of time. At around 10pm on Thursday 26th. February, my dear, sweet, gentle and kind mother sadly passed away. Words will be difficult to find, words might struggle to flow, but no end of words will ever do justice to the life of Esme Amy Axon, who left us a few days ago at the age of eighty-five. In the last chapter, I spoke about my mother’s recent short stay in hospital and how I was buoyed by her seemingly good recovery from ill-health, but it was a horrible false dawn. Worried by my mother’s weight loss, I decided to miss the Burnley home game to stay and look after my mother and I stayed away from work all week, too. I am so grateful that I made that decision. As the days passed throughout that week, with my Mum’s health faltering and then momentarily improving, I quickly sensed that work didn’t matter too much and neither did football. Chelsea, my obsession, was put into bleak perspective; after attending seven games in January, I only attended one game in February. It eventually became the darkest month of my life. The first day of March would be a testing day for me, but I had soon decided that I needed to attend our Capital One Cup Final against Tottenham. To stay at home, possibly alone, would have been unthinkable. As I awoke after a solid and sound eight hours of sleep on Sunday morning, football itself seemed an irrelevance, but my main desire was to meet up with some of the most wonderful friends anyone could ask for. I collected PD at 7.30am and Parky at 8pm. To give me a break, we caught the 8.37am train from Chippenham. Soon into the journey my two companions were knocking back the cider. I sipped a strong coffee. I was doing OK. I was quiet but content. Zipping through the towns of Reading, Maidenhead and Slough brought back fresh memories of a trip by train to Chelsea with both my parents in 1981 and 1982. Good memories. Strong memories. As the day developed I was sure there would be more. It was a cold but sun-filled morning. We hopped on the tube at Paddington and were soon meeting up with others at The Tyburn at Marble Arch. We soon bumped into Gal, and I received the first of many warm embraces from friends throughout the day. Bob, over from San Francisco for a couple of games, was already in the pub. Daryl, then Neil, then Alan soon arrived. More hugs. Breakfasts were ordered. Again, I was OK. It was lovely to be among friends. At around 11.15am, we shifted to our old favourite, The Duke Of York. The pub was already full of Chelsea. A sizeable portion of The Goose’s regulars had simply shifted a few miles north. More hugs. To be honest, after we toasted the memory of my mother, I was hardly in the mood for lager. I don’t think I have ever sipped two pints so slowly in my life. There was time for me to detail the events of the past few days, weeks and months. Friends shared a few memories of my mother, who made the occasional trip to Stamford Bridge in her later years, and who also met friends on their visits to Somerset. Off the top of my head – and few friends would doubt my memory – my mother’s last five trips to Stamford Bridge were against Charlton Athletic in 1988, Everton in 1991, PSV Eindhoven in 1996, Birmingham City in 2005 and Watford in 2010. It was a joy for me to be with my mother for the 2005 game; my mother had witnessed a part of our first League Championship in fifty years. What joy! The Watford game five years later was on my mother’s eightieth birthday. Again, a wonderful memory. Does anyone think that was my mother’s last ever live sporting event? If you do, you are wrong. Later in 2010, I took my little mother to the US and we saw baseball games in Philadelphia and at Yankee Stadium. And only sixteen months ago, on a trip to Scotland, Mum was alongside me at Brechin City’s outrageously picturesque Glebe Park for a game versus Ayr United. Mum loved her trips to Scotland; after my father passed away in 1993, it became a regular event. For six straight years, we made an autumnal trip to various cities in Scotland. Mum saw Scotland – and Pat Nevin – at Hampden Park in 1994 and we also paid a lovely visit to Arbroath in 2009. I have photographs from most of these trips and – of course – I will be hunting these out over the next few emotional and delicate weeks. All told, my mother went to a few games shy of thirty Chelsea games. Two other games are worthy of re-telling. In around 1972, I saw my first-ever Frome Town game. I had watched my local village team, who I later played for on a few occasions, at the local recreation ground, but the trip to Badger’s Hill for a Western League game on a wet autumn afternoon was the first time that I had seen a ‘’proper’’ game. Sadly, Frome lost that day – I remember being really sad – but my most vivid memory is of sitting alongside my mother (my father was working in his menswear shop in the town centre) and sharing a bag of cherries at half-time. Yes, that is correct – my mother took me to my first ever ‘’real’’ game of football. Bless her. One of the travelling salesmen who used to periodically call in at my father’s shop was a chap from Exeter. My father soon told him of my love of football and, in a pre-curser to corporate hospitality, the salesman managed to obtain three of Exeter City’s allocation of tickets for the 1978 Football League Cup Final between Liverpool and Nottingham Forest. I must admit at feeling rather guilty about travelling to a game not involving my team, but seeing a match at Wembley was a huge thrill. We had three lower-level wooden bench seats near the Forest end. It was a pretty dull 0-0 draw, and I remember thinking how small Wembley seemed. I expected it, from the fish-eye lens perspective of TV cameras to be ridiculously huge. I remember thinking Stamford Bridge to be smaller than I had imagined on my first visit, too. Anyway, there you have it. In 1978, my dear mother attended a League Cup Final at Wembley. Thirty-seven years later, I was too. Of course, our two most recent League Cup wins were in Cardiff. In fact, our sole Wembley win in the competition was back in 1998 versus ‘Boro. Our other win – one of only four major trophies that our club had won in its first ninety-two years – was a two-legged final in 1965. I fancied a little time to myself, so left the other drinkers, and walked to Marylebone. It really was a crisp and sunny day, but with a wicked swirling wind. I was soon alighting at Wembley Stadium at around 2.45pm. There was a quiet calm. To be honest, the walkways around the stadium seemed eerily silent. Maybe the old Chelsea adage of “one last pint” was in full effect. This game, incredibly, would be our thirteenth game at the new Wembley. I had managed to source a ticket from a mate for another mate who was travelling down from Glasgow, but arranging to meet both parties at 3.30pm meant that I was caught up in a major melee to enter the block K turnstiles. Frustrations were running high; sadly, I missed the kick-off by a couple of minutes. I took my seat alongside nine friends. Daryl, Neil, Alan, Gary, Parky, PD, Walnuts, Milo, Simon, Chris. We were in the very last row of the upper tier above the corner flag where Frank Lampard did his spontaneous homage to his father after scoring against Everton in 2009. We stood the entire game. The scale of the new Wembley is quite staggering, especially from our lofty perch. The side stands go on for ever. I spotted a few Chelsea flags draped on the balcony walls, but very few Tottenham ones. Although I hated the defeat to them in the 2008 final, my worst memory of that day was the fact that Chelsea were heavily out sung by them. I did not want a repeat. In all honesty, I thought both sets of fans were rather quiet, especially in the first-half. The big surprise was the appearance of Kurt Zouma in a midfield role alongside Ramires. Petr Cech in goal. A midfield three of Cesc, Eden and Willian. There were few chances in the first-half. Chelsea had a few headers which did not cause Spurs too much anxiety. After a run by Kane, the undoubted danger man, a free-kick was rewarded to Spurs outside our box. A hard strike by Eriksen thumped against Cech’s bar. Hazard shot wide. Our play seemed to be a little unadventurous at times, with most of our chances coming from set plays. I thought John Terry had a magnificent first-half, with Willian buzzing around tirelessly. Dave, too, was solid. With half-time approaching, I looked across at the huge upper tier opposite; I could hardly believe that so many fans – and they were mainly our fans – had vacated their sets with still a few minutes left. Why would they choose a pie, a pee, or a pint over watching a Chelsea Cup Final? On forty-five minutes, a lofted ball by Terry was sent over to Ivanovic, but Chadli fouled our right-back. The resultant free-kick by Willian seemed to ghost past several Spurs defenders before eventually being deflected back to John Terry. To be honest, I was watching all of this through my camera lens, so details are scant. I did, however, see the net bulge and I did hear the resulting roar. I did not react. I don’t think I will ever react to a Chelsea goal at Wembley as calmly as I did at around 4.45pm on Sunday March 1st. 2015. I think that the events of the previous three days had taken their toll. Sure, I had encouraged the team on with shouts of support during the first-half, but I did not feel the need to “lose it” on this occasion. I simply took a few photographs of John Terry – so glad it was him – running away towards a Tottenham corner and being mobbed by his comrades. There were a few lovely smiles towards me from the chaps. Just after, unbelievably, we had a great chance to double our lead. Cahill rose to head low, but Loris reacted superbly and clung on to the ball. 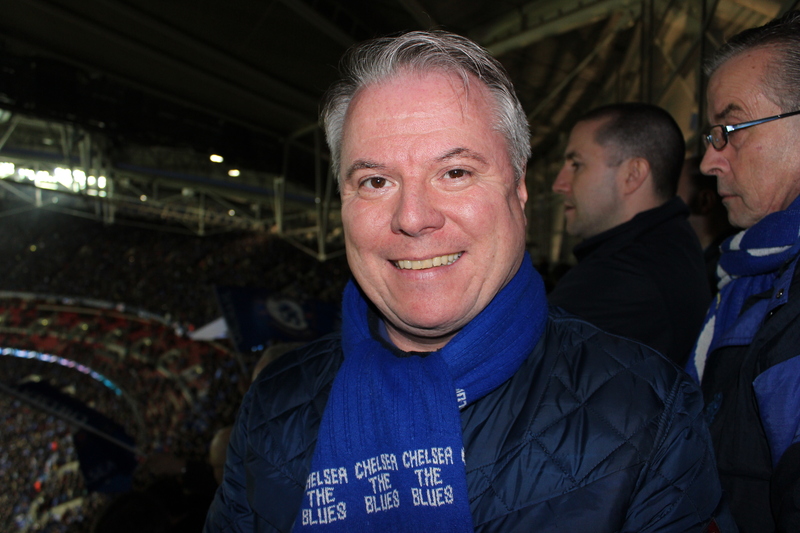 At half-time, I had time to explain to a few of the lads why I was wearing my “Chelsea The Blues” scarf, which last saw the light of day on a rainy day in Moscow. After my very first game at Stamford Bridge in 1974, while I was talking to my father outside the West Stand, my mother – on the quiet, quite unannounced – shot off to buy me this scarf from one of the blue wooden huts which teetered at the top of the bank of steps leading down to street level. It has stayed with me for the past forty-one years. It is in remarkably good condition. Now, I’m not a wearer of club colours, but I chose to wear it in Stockholm – definitely a lucky charm – in 1998 and then again in 2008. Wearing it in 2015 was a simple choice. He did. His powerful shot miraculously ended-up in the net (it was a mystery to me at the time how it evaded Loris) and the strangers to my right were hugging me and laughing at my comment. Now I could celebrate a little more. This felt great. I snapped as Costa ran to the corner. The noise boomed around Wembley. More lovely smiles from the lads. The heavens opened and the rain poured down. The wind seemed to be blowing it towards the Tottenham fans, and many in their lower tier hid for cover. The first few red seats were starting to appear. Two good chances from Hazard and Fabregas came close. We were rampant. The noise increased. A lovely rendition of “Born Is The King” swept around the western terraces. Although I had been too subdued to sing along to many of the Chelsea standards, I knew I had to join in with that one. I commented continually to Simon; I was able to relax and enjoy – if that is the right word – the last thirty minutes, twenty minutes, ten minutes, five minutes. A fine defensive performance was highlighted by a couple of wonderfully-timed blocks by Cahill and Terry. The kid Zouma was fantastic. We simply gave them nothing. Our end was awash with royal blue flags. The minutes ticked by. At the final whistle, there was a smile from myself to my mother and a kiss of her scarf. The boys came over, one by one, to hug me. In Munich there were tears of joy. There were no tears at Wembley. There had been little moments of silence, of quietness, of tears, throughout the day, but at Wembley I was just happy that the team had won. A defeat, after the past few days, would have been awful. Simon took a photograph of me and the scarf. It was a very special moment. I looked behind me and spotted that the Wembley arch had turned blue. As the cup was presented and as the players joyfully cavorted in a time-honoured Chelsea tradition dating back to May 1997, I was calm. There were the usual Chelsea songs at the end of the celebrations; I quietly whispered the words of “Blue Is The Colour” and a few of the boys were dancing to another favourite. As always, we were some of the last to leave. As we began the descent, our hymn from 1997 boomed out. I kissed my scarf again. Dedicated to the memory of my little Mum, who gave me so much and expected so little in return. In my heart forever. Esmé Amy Axon : 3 January 1930 to 26 February 2015. This entry was posted in Season 2014-2015 and tagged 1996-1997, 2014-2015, Parents, Tottenham Hotspur, Wembley by Chris Axon. Bookmark the permalink. A touching story, Chris. My mum died in 2013 so the pain is recent for me, too. I was at the games in 88 and 91 and had that scared as well. My mum couldn’t understand the point of football and never wet to a game in her long life. What a tribute. What a day. What a club. What a mum. You are one lucky guy. Chris, I have been in your shoes, and know that there are no words. I do wish you peace, and a lifetime of warm memories. I was very much looking forward to your adventures this week, but instead you’ve given us something much more: a large dose of humanity. Thank you, sir. Sorry about your loss. She was a couple of months older than my dad, who lives on, but comfortably outlived my much-missed mum. All the best. Many thanks Peter, and all of you. The healing process has been greatly helped by everyone’s lovely comments. Wow what a beautiful and moving tribute – sat at my desk in tears. May your mum R.I.P. hi Chris, fantastic read through a few tears, my wife died out of the blue (pun intended) last October so I feel for you fella, she hated football with a passion but even she would stand on 1 leg when asked to prevent free kick or penalty from going in for my beloved Chelsea. You cant imagine on how many goals she walked in front of the tv over the years and was even able to do the same when the replay came on again. Im originally from just off Northend Road but now live in Frome. All the best Mate and enjoy the memories of you dear Mum. Lovely blog Chris. You’re a lucky lad to have had such a loving relationship. That love, and those memories will see you through mate. I’m in a similar situation with my Mum, she’s 80 today. She insists on sending me mobile text updates (scores, substitutes, cards etc) of all Chelsea games that I can’t make whilst I’m working at Tilleys lol. The other Chefs think it’s hilarious. Wonderful tribute to a lovely sounding Mother & Lady, so sorry for your loss, ive been there myself. We are all behind you Chris , Such a hard time for you and to put down in words even harder.. So sorry to hear about your mother. So sorry for your loss. I had feared the worst when you went off the radar for so long. Having gone through the same the only words of consolation are that the pain lessens as time goes by. Its best to focus on how your mom would have wished you to feel on her passing. Oceans apart but near in our hearts. All the best Chris.